Geographical situation : Sea. Address: Carrer manol. sea, 0,8 Km from shops, 0,8 Km from Town Center. 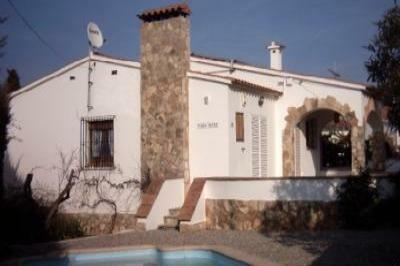 Type: Villa - 5 Rooms - Detached - One-level - 90 sqm. Garden, Private parking, Private swimming pool. Bedding : 4 single beds, 1 double bed, 2 sofa beds. Cleaner, Iron, Air conditioning, Central Heating. Outside Equipment: Garden furniture, BBQ, Sun Lounger. Remarks : Animals accepted, Car recommended. Hiking, Mountain-biking, Night club, Amusement Park.